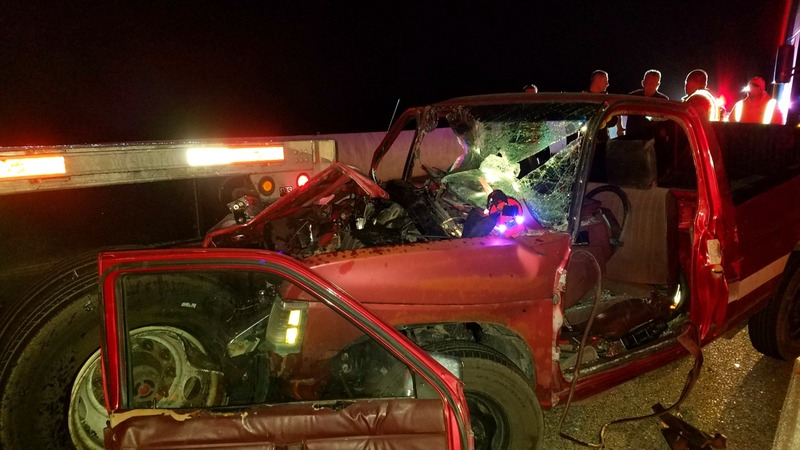 ST. GEORGE — Two drivers escaped possible fatal injuries when a pickup truck slammed into the flatbed trailer of a semitractor-trailer parked on the shoulder of Interstate 15 Tuesday evening. Shortly before 8 p.m. officers and emergency personnel were dispatched to a crash on I-15 northbound near mile marker 35 near Kanarraville involving a Freightliner pulling a flatbed trailer loaded with drywall and a Nissan pickup truck. Intermountain Life Flight was also launched when dispatch was alerted to the seriousness of the crash, Utah Highway Patrol Sgt. Larry Mower said. The driver of the Nissan was seriously injured, Mower said, and was transported to Dixie Regional Medical Center by ground ambulance in serious but stable condition. The incident started when the driveline of the semi failed near northbound I-15 mile marker 35, and the driver pulled off the interstate onto the right shoulder, which left the trailer partially blocking the right lane. The driver got out of the truck to set up safety triangles around the trailer to warn passing motorists that the lane was blocked. However, before all of the safety triangles could be placed, the Nissan pickup truck slammed into the flatbed trailer. “That area is pretty dark, so the driver may not have been able to see the blockage until they were right up on it,” UHP Trooper Colton Freckleton said. The semi driver was able to get out of the way in time and was uninjured during the crash. Two of the three lanes were closed to allow responders to tend to the scene, while the left lane remained open for traffic. Shortly before 9 p.m., all lanes were reopened, according to a UDOT alert. The Nissan was destroyed in the crash and was subsequently towed from the scene, while the flatbed trailer sustained minimal damage. Oh that’s a tough one! The trailer hit too high for the airbags to go off, I think. And how often does the drive train fail, seems rare to me. It looks like it could be a pre 1999 Year truck. I don’t think airbags were standard in cars and trucks until about 98 or 99. They’re very lucky to have survived. Best of luck on their recovery. That kind of accident usually happens when the semi driver swings out in front of you at the last second to pass another semi going 1/2 mph slower. Then you hold back and watch while the two semi trucks drag race for 3 minutes.